How To Survive a Huge Python Attack – What Do You Do? What Do You Do When a Python Tries to Kill You? I think about this scenario far too often. There have been a couple of times I have been near thick foliage and undergrowth, and heard something coming closer to me. I couldn’t see it, but it was in there. Ha! I sound paranoid, right? You spend 3-4 hours in Thailand’s rainforest by yourself and see what your mind does. Most nights I’m absolutely fine. I don’t fear ghosts. I don’t fear the people I meet in the jungle – most times. I don’t fear venomous snakes because I figure anything I do that gets me in trouble is within my control for the most part. There’s a very slight chance I’ll die in the forest from a venomous snake bite, and I don’t fear that at all. I do fear something hunting me though. Tigers, leopards, bear, and big pythons. Recently a rubber tapper in Indonesia went out alone at night to collect latex from the rubber trees in the plantation. He didn’t come back. Friends went looking for him. 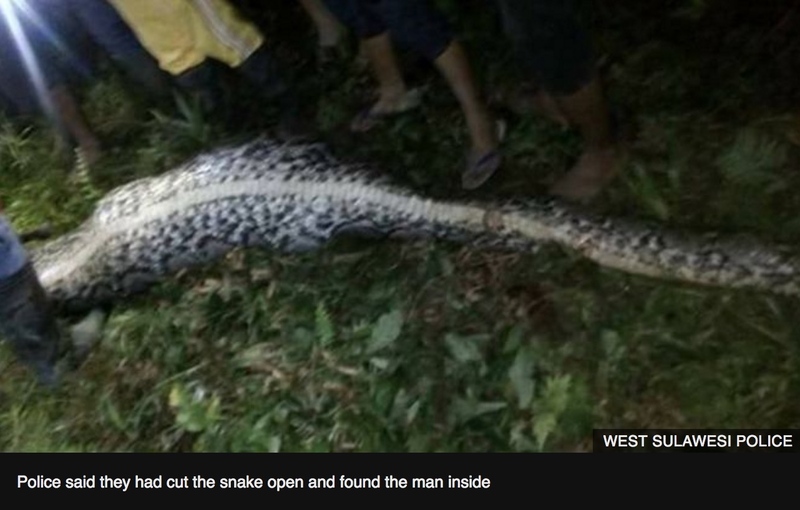 They found him in the stomach of what they said was a seven meter long Reticulated Python. That’s a big snake. People were incredulous, could it REALLY eat a person? Are you KIDDING ME? They can eat ALLIGATORS. What makes you think a person is any different? Wait, there are “OCCASIONAL reports of them swallowing animals? There are thousands! Happens thousands of times everyday. Pythons eat dogs, cats, birds, chickens, pigs, alligators, small deer, and many other animals! Just a few minutes of research would have turned up the fairly recent study that shows that people who die as a result of python attack, die because their blood pressure raises so high – that the heart cannot beat. The heart is stopped and death occurs. It isn’t asphyxiation that is the cause of death. So, the purpose of this article is to entertain WHAT TO DO IF A PYTHON HAS BITTEN YOU – AND IS WRAPPING AROUND YOU QUICKLY. Pull out a knife as fast as possible. The knife should have a lanyard to wrap around your wrist so you can do #3. Keep the python from wrapping around you at all costs. When possible – stab the snake in the side or belly repeatedly and many different places. Don’t stop. Stop when the snake lets go and you can run away as fast as you can. Hope the snake lets go. That has been my plan for about the last decade. I’m not sure if it would work. I’d like to have a better plan. If you can think of one, DO LET ME KNOW. Some other ideas… and yes, these are bad – horrific – but, if you’re in a life or death situation, you need to do whatever you can to stay alive, right? I mean, who wants to become snake food. If the eyes were visible at all – jam a knife, pen, rock, stick, anything – into the eyes repeatedly – ripping the eyes out if at all possible. Bring a container of strong mouthwash, or isopropyl rubbing alcohol and keep it in your shirt pocket – easily accessible. Snakes have been shown to let go every time they encounter a face full of mouthwash. If you could keep a bear-trap handy, and just spring it on the size of the body of the beast, that might be enough to make it reconsider biting you. I know, you’d have a serious risk of closing it on your arm as you tried to catch the snake with it. I wonder if a small saw would be the best weapon to have. A saw with a blade on it that can saw through 2-3 inch branches might be ideal. Not sure where you’d keep a saw of that type handy on you at all times, but you’d be damn glad you had it when the time came. I think this might be the best violent way to remove the snake. You could saw through a python’s vertebral column in a matter of seconds with the right saw. Anyway, that’s what I came up with. WHAT DO YOU THINK IS THE BEST IDEA? can inject in a poisonous chemical could also be very good! I have read that zookeepers use hot water to force constrictors to uncoil, or alternatively, pouring alcohol or hard liquor on the snake’s face and in its mouth is a reliable method. I do not know how reliable it is, however some claim that bending a constrictor’s tail over its dorsal side (back or top side) will cause it to release. Maybe a good idea to carry a flask of booze when in the rain forest or Everglades, or when zookeeping. Sounds about right… mouthwash works according to some. I am relieved to note that pouring hard liquor is effective in warding off python attacks. Arming myself with a bottle of whiskey at all times will surely help. My wife will think i am the python however and i will have to deal with that. hah! Whatever it takes, right? I was thinking about biting too – but if you handle a big python, you’ll realize that you probably couldn’t even bite through the thick skin. WTF…bite it. Yeah right mate. Remind me not to go jungle trekking with you anytime soon. I was bored out of my mind doing homework and thought of this and I’m very glad I stumbled upon this article. The mouthwash method sounds very successful to me. lol – yeah, this is more exciting stuff than homework. Now get back to work! ha! Is any electronic radiation device helpfull to keep them away. Or pepermint oil keep rats away.? I don’t know any gimmick that keeps snakes away. Best bet is seal up house and yard and remove food – rodents, frogs, lizards, geckos. Always carry a large knife and if bitten, quickly stab the neck or saw through the base of the snakes neck. I assume once you cut through, it’s pretty much over for the snake. And the neck is a vital and thinner area to cut/stab through. I guess I think about not killing the snake if possible. But, yeah, in that circumstance, it’s war. no, but the strong muscles wrapping around you can render you immobile. Yes some of these methods could very well work, however, these pythons are lightning fast, they strike quicker then the eye can see, the chances of you using your arms is going to be slim as you will be wrapped up before you even realize whats happening. At this point, any movement you make is going to make the python squeeze even harder, it’s instinct. The best real chance you have at this point is to hope you are not alone and someone there can assist you by simply having them grab the snakes head which will enable them to control the snake. If you can control the head then you can control his whole body and be able to remove the python with less effort. With a big python, nobody is going to control the head once he’s wrapped up. Best bet with a buddy is the buddy starts unwrapping from the tail. Snakes are cold blooded and need a warm environment to function. Perhaps if someone has access to a CO2 fire extinguisher they could discharge it on the snake’ head and freeze it’s brain. Of course,if you’re all alone in the bush that wouldn’t work. Maybe a sharp machete would work best to chop it in half near the head. ha! Maybe one of Elon Musk’s flame throwers that aren’t flame throwers? If you wear a hard leather jacket studded with sharp steel studs fixed all over, the python cannot wrap around you, if it wraps around it injure itself so it will not tighten its wrap around you. You can easily kill it with a sharp knife. Before trying this one watch the video of the guy who tried to get swallowed by a python while wearing plate armor. Didn’t work out too well for him. But why? I read most of the article, no mention of snake at all. Was there? Pinch or plug nostrils ? Whatever you use needs to be able to be used one-handed in case it’s a hand they bite and latch onto. Any flask of liquor or mouthwash would need to be in a squeeze bottle. I’ve also read corrosive powders like lime are good to ward them from your camp area. But I guess some modern lime dust isn’t as corrosive as it used to be. Moving to the Philippines I often think about this too. Not only pythons but cobras too. Fortunately the cobras there are not king cobras and don’t spit. My pastor there told me if you don’t hear the bullfrogs croaking at night, be wary. The old reliable buddy system is always the best idea.